I can’t believe Nicholas has spent the afternoon in board shorts. It’s May. It’s the UK. I could get used to this weather! What’s the perfect thing to eat when it’s hot? Ice cream of course! And I can’t get over how simple this recipe is. You don’t need an ice cream machine and you only need one ingredient. Yes, I said one. It takes very little effort and it tastes great. It’s great for all the family and it’s dairy-free. It couldn’t be more perfect. I caught a bit of a cooking show recently where two contestants cooked dinner in their homes for a group of strangers who then paid what they thought the dinner was worth. One was serving ice cream for dessert, but I was confused as she hadn’t done any preparation. Where was her ice cream maker and how could she be making it while her guests were eating their mains? She used a food processor but it still wasn’t clear how she made it. Her guests loved it and I started searching online for recipes. So what I discovered was that frozen berries blended together in a food processor become a wonderful creamy ‘ice cream’. It sounded too easy. Why didn’t I already know about this? Before I got the chance to buy some berries to try it out, I stumbled across a very popular recipe on Pinterest using bananas rather than berries. Even better! The bananas I used weren’t overly ripe. However, the riper and browner they are, the sweeter your ice cream will be. Prep time is cutting up the bananas, waiting for them to freeze and then blending them. 2 bananas make about 2 adult servings. 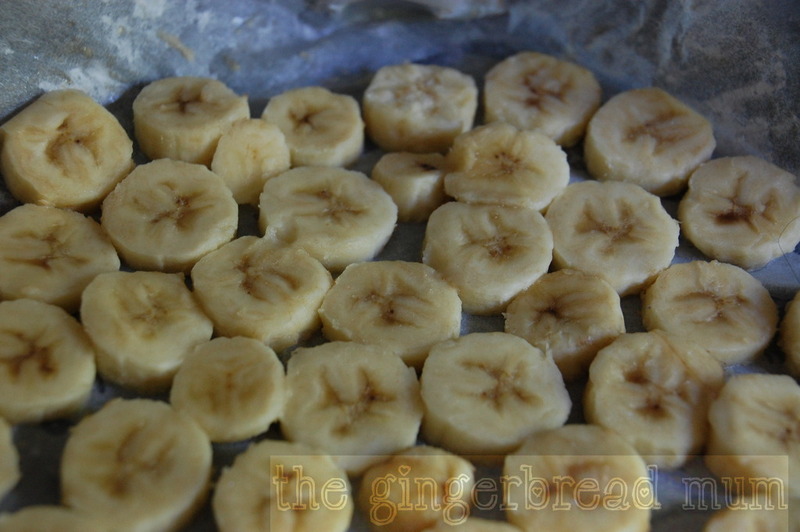 Cut your bananas into slices about 1cm thick and lay them on a tray covered with baking paper. Put in the freezer for a few hours until frozen. If you’re not going to use them immediately, put them in a bag and keep in the freezer. Put your frozen banana slices into a food processor. 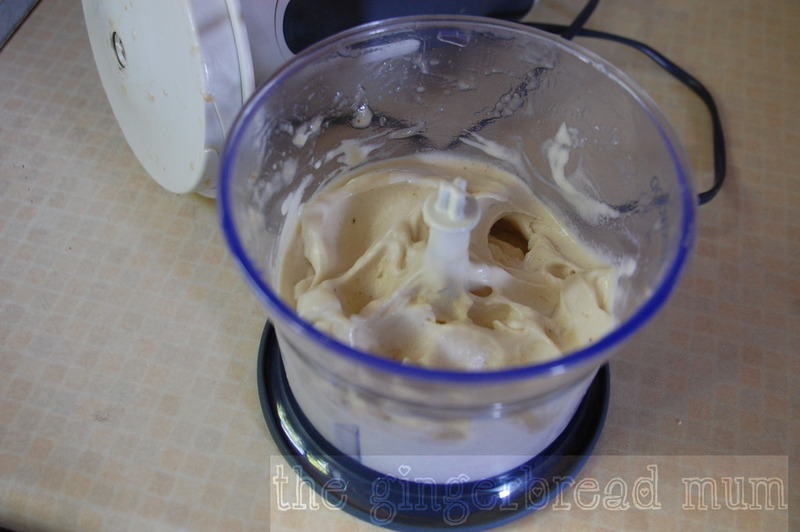 For the small amount I made I used my mini food processor. Blend and blend, scraping down the sides, until it becomes creamy (about 5 mins). Don’t worry if you think it’s not going to get creamy, don’t be tempted to add anything, just keep blending. That’s it, you’re done. Now all you have to do is grab a spoon and try it, and I’m sure you’re going to be impressed with your effort. Just make sure to leave some for your munchkin to enjoy! It’s definitely creamier if you eat it immediately. Freezing it again makes it icy and colder to eat, although you could blend it another time. 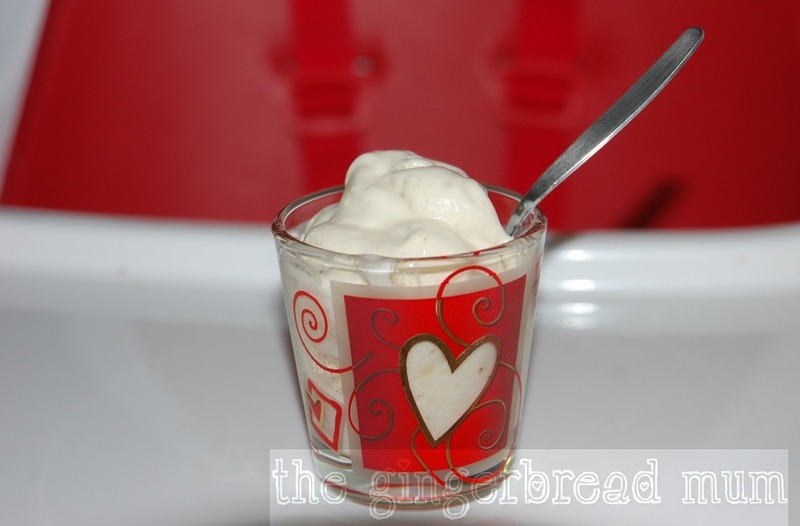 Posted in baby, dessert, family, recipe, toddler and tagged baby, banana, banana ice cream, dairy-free, dessert, family, gluton-free, ice cream, recipe, sugar-free, toddler, vegan, vegetarian. Bookmark the permalink.